These little town blues, are getting in your way, so start spreading the news, you’re having a party today! Bring all the glamor and excitement of New York without ever having to buy an airplane ticket or pay for a hotel. Turn Sweet 16 in the big city! New York is a city of tickets – to the theater, sporting events, train or subway. So what better way to invite your guests to a night in New York than with an actual ticket? Party411.com can create a fabulous photo ticket invitation just for you. Make it into a magnet and it can stick right to your guests’ refrigerator. Once everyone hears about this party, they’ll be trying to find scalpers to get an invitation! You can also surprise the birthday girl with a Sweet 16 Custom Caricature invitation. On this invite, have the birthday girl in a gorgeous evening gown in the center of Times Square with a group of paparazzi behind, or have the guest of honor standing in an "I (Heart) New York" tshirt in front of the Statue of Liberty on a sunny day! The sky's the limit for this customized invite! A Skyline design with a great cityscape. A New York cab design is perfect for a New York party. 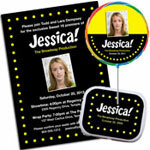 Broadway theme invitations and party favors... your name in lights! Put confetti in the envelope for a special touch. Another great invite style are Backstage Pass invitations. Give your guests the VIP treatment to the hottest show in New York... your Sweet 16! To Rachel's 16th birthday party! Let's go out on the town! Feeling creative? 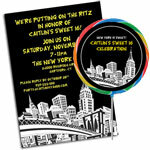 Design your own invitation in the shape of an apple (remember New York is The Big Apple) or a skyscraper. Use bright red paper for the apple and shiny silver for the building. Write the party information on the back in black or silver pen. There are so many decorating possibilities for a New York theme party. Central Park is one of New York’s most famous and beautiful landmarks. Few of us can have a lake, boat house or walking path in our front yard, but it can still be scenic and bright. Black city street lights placed along a front walk look elegant and romantic. And how magical will the entrance to your party look with small, white twinkle lights on bushes and trees? Light up your tables with mini city street lamps, reminiscent of the bright lights of Manhattan! Pay homage to everyone's favorite New York sites by theming each table. A "Statue of Liberty" table might include a small cardboard standup of the iconic lady with Statue of Liberty keychains at each seat for favors. Try the Empire State Building, Madison Square Garden, Central Park, Times Square, Little Italy, Chinatown, the Brooklyn Bridge, Broadway, and Wall Street as themes for each table. Let the Big Apple inspire you! Guide guests to their seats with taxi cab place cards. Buy toy taxi cabs and slide a place card through the top or side door. These fun reminders of New York's busy streets serve as favors too! Weave black and white boas around centerpieces, and toss silver party beads on tables so guests can deck themselves out in some bling! Add votive candles around centerpieces to add a festive glow to the party. The table is set, now it’s time to eat. New York is famous for its restaurants and eateries so be sure to offer your guests a sampling of the City’s finest! Your guests will love a buffet overflowing with egg rolls and chow mein (from Chinatown), hot dogs (remember Nathan’s? ), pizza (home of the famous slice), corned beef and pickles (from the Lower East Side), hot pretzels and roasted chestnuts (found on any street corner), and cheesecake (Lindy’s is the best). Make labels for each buffet item, paying homage to some of the best restaurants and street corner food in the world! Also, try combining some or all of these New York delicacies with your own specialties for an evening that’s as delicious as it is fun. Authentic "I (Heart) New York" souvenirs would be a quick and cool favor option. You can buy tshirts, coffee mugs, pencils, and hats online. Try sticking a couple of iconic New York souvenirs (like a Times Square snow globe or a miniature Statue of Liberty figurine) in an "I © New York" tote. Guests will love these easy take home gifts they can use again and again. Stick an "I © New York" sticker on a red delicious apple. How appropriate for the big city! Take a picture of the birthday girl and her friends, and before guests leave, print the pictures and put them in themed city skyline photo frames. The girls will love this personalized memento! Fill New York Theme Party Favor Bags with fun New York sticker sets and delicious salt water taffy. If the birthday girl is a baseball fan, fill favor bags with New York gear, like a New York Yankees note pad or a New York Mets beach ball. New York is a city of magic and wonder just like your New York, New York party will be. From Party411.com, have a fun and happy Sweet 16!